Determining whether you need support brackets or not for your countertops can be challenging as there are a lot of things to be considered to make the right decision. This article will outline the factors to be considered in deciding whether you need support brackets or not, as well as some brackets options, and where you can get them from. Amount of overhang you have is the most important factor to consider in deciding whether you need support brackets. Most granite fabricators will recommend support brackets on overhangs over 12″ however, solely based on the overhang amount. Final determination on bracket requirements and spacing should be recommended by your fabricator based on the following factors. 2- How Sturdy is the stone? Some stones are more durable than others so knowing your stone is important in determining the brackets. Most dark color granite is very durable such as absolute black, uba tuba, steel gray, impala black. Some exotic light granite having natural fissures in them are more fragile, so they need more support than others. Some of this type of exotic granite include typhoon bordeaux, fussion, lemurian blue. Most marble is fragile so needs more support. Quartzite is a very hard material in general but it is common that quartzite slabs will have natural fissures in them so they need to be well supported. Soapstone is a very soft natural stone. Onyx is one of the most fragile natural stones, so it needs to be well supported. As onyx is a translucent stone, supports underside of the stone may be visible so it needs to be well planned. Quartz in general is very homogeneous and sturdy. Find below Caesarstone‘s support guidelines for quartz only. Cut outs close to the overhangs create risk, therefore, needs to be supported. The most common cut out type that would create this issue is the cooktop cut out. Sink cut outs, any other cut outs close to the overhangs also create risk. You may need support systems even when you do not have much overhang if your base is not big enough. A good example of this is raised bars sitting on knee walls. The walls are usually 4 5/8″ wide including the dry walls. In this case, you will need support brackets, or plated installed before your countertops are installed. Heavy duty support brackets and/or sub tops need to be used where there is no base to support stone. 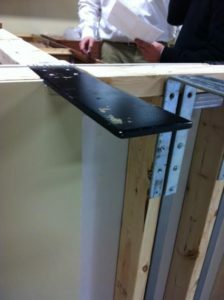 In conjunction with front legs, securing wood support cleat on the backwalls will also help support the countertop. When you use heavy duty brackets, you need a solid wall build by wooden studs. If your wall has metal studs instead, you will need to build additional wood or plywood to support the brackets.